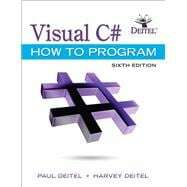 For all basic-to-intermediate level courses in Visual C# programming. Created by world-renowned programming instructors Paul and Harvey Deitel, Visual C# How to Program, Sixth Edition introduces students to the world of desktop, mobile and web app development with Microsoft’s® Visual C#® programming language. Students will use .NET platform and the Visual Studio® Integrated Development Environment to write, test, and debug applications and run them on a wide variety of Windows® devices. At the heart of the book is the Deitel signature live-code approach—rather than using code snippets, the authors present concepts in the context of complete working programs followed by sample executions. Students begin by getting comfortable with the Visual Studio Community edition IDE and basic C# syntax. Next, they build their skills one step at a time, mastering control structures, classes, objects, methods, variables, arrays, and the core techniques of object-oriented programming. With this strong foundation in place, the authors introduce more sophisticated techniques, including searching, sorting, data structures, generics, and collections. Additional practice is provided through a broad range of example programs and exercises selected from computer science, business, education, social issues, personal utilities, sports, mathematics, puzzles, simulation, game playing, graphics, multimedia and many other areas. Paul Deitel, CEO and Chief Technical Officer of Deitel & Associates, Inc., has over 35 years of experience in computing. He is a graduate of MIT, where he studied Information Technology. Through Deitel & Associates, Inc., he has delivered hundreds of programming courses worldwide to clients, including Cisco, IBM, Boeing, Siemens, Sun Microsystems (now Oracle), Dell, Fidelity, NASA at the Kennedy Space Center, the National Severe Storm Laboratory, NOAA (National Oceanic and Atmospheric Administration), White Sands Missile Range, Rogue Wave Software, SunGard, Nortel Networks, Puma, iRobot, Invensys and many more. He and his co-author-, Dr. Harvey Deitel, are the world’s best-selling programming-language textbook/professional book/video authors. Paul was named as a Microsoft® Most Valuable Professional (MVP) for C# in 2012—2014. According to Microsoft, “the Microsoft MVP Award is an annual award that recognizes exceptional technology community leaders worldwide who actively share their high quality, real-world expertise with users and Microsoft.” He also holds the Java Certified Programmer and Java Certified Developer designations and is an Oracle Java Champion. Dr. Harvey Deitel, Chairman and Chief Strategy Officer of Deitel & Associates, Inc., has over 55 years of experience in the computer field. Dr. Deitel earned B.S. and M.S. degrees in Electrical Engineering from MIT and a Ph.D. in Mathematics from Boston University–he studied computing in each of these programs before they spun off Computer Science programs. He has extensive college teaching experience, including earning tenure and serving as the Chairman of the Computer Science Department at Boston College before founding Deitel & Associates, Inc., in 1991 with his son, Paul. The Deitels’ publications have earned international recognition, with translations published in Japanese, German, Russian, Spanish, French, Polish, Italian, Simplified Chinese, Traditional Chinese, Korean, Portuguese, Greek, Urdu and Turkish. Dr. Deitel has delivered hundreds of programming courses to academic, corporate, government and military clients.